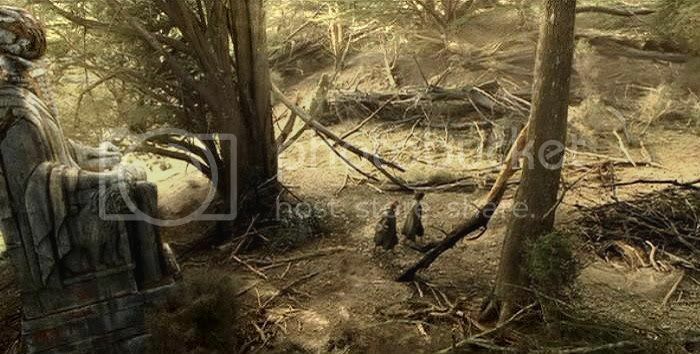 I've said most of what I want to say about this scene in the previous entry, Ithilien Pt. 4. More is expressed about this scene in an excellent poem by jan-u-wine, which appears below. Like the "We're not in decent places" scene before it, the Cross-roads scene is shot beautifully, the lighting superb. 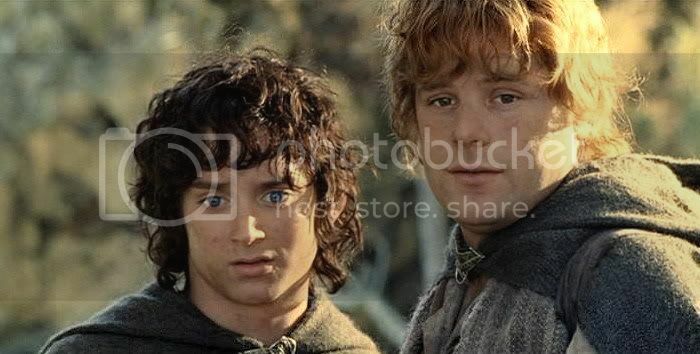 The performances are engaging, and Frodo and Sam look meltingly lovely. Film scene: “The King Has Got a Crown Again”: EE scene. The three draw near to the foot of the statue at the Cross-roads. Frodo: I think these lands were once part of the kingdom of Gondor. Long ago, when there was a king. The camera pans up to the top of the statue, showing the stone the Orcs have put there instead of the king’s head. Under a brooding sky the three walk on, passing the stone head of the king lying in the grasss. White flowers wreath its brow. Frodo looks at it as they file past but does not speak or stop. As they walk the clouds open enough for a shaft of sunlight to pierce through. Sam looks back to see the head illuminated in the golden light . 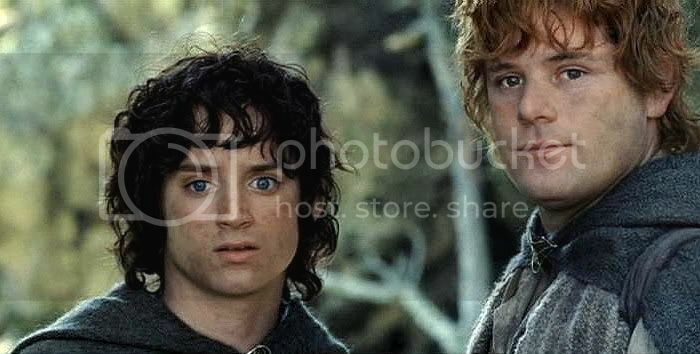 Sam: Mr. Frodo, look! The king has got a crown again. 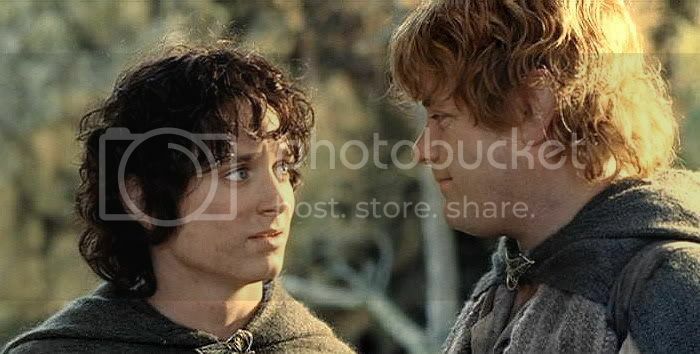 Frodo and Sam look at it and exchange smiles, but their smiles fade when the gloom returns. 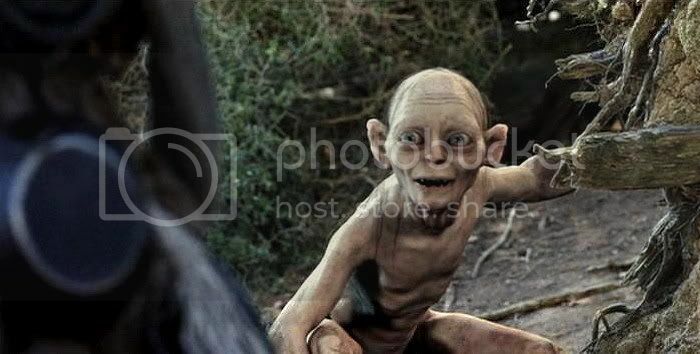 Gollum: Come on, hobbits! Mustn’t stop now! This way. Book scene: from The Journey to the Cross-roads. Down from their hiding-place they went, and then turning south they steered as straight a course as Gollum could find across a long broken slope that leaned up towards the mountains. Presently, not far ahead, looming up like a black wall, they saw a belt of trees. As they drew nearer they became aware that these were of vast size, very ancient it seemed, and still towering high, though their tops were gaunt and broken, as if tempest and lightning-blast had swept across them, but had failed to kill them or to shake their fathomless roots. ‘The Cross-roads, yes,’ whispered Gollum, the first words that had been spoken since they left their hiding-place. ‘We must go that way.’ Turning eastward now, he led them up the slope; and then suddenly there it was before them: the Southward Road, winding its way about the outer feet of the mountains, until presently it plunged into the great ring of trees. As furtively as scouts within the campment of their enemies, they crept down on to the road, and stole along its westward edge under the stony bank, grey as the stones themselves, and soft-footed as hunting cats. At length they reached the trees, and found that they stood in a great roofless ring, open in the middle to the sombre sky; and the spaces between their immense boles were like the great dark arches of some ruined hall. In the very centre four ways met. Behind them lay the road to the Morannon; before them it ran out again upon its long journey south; to their right the road from old Osgiliath came climbing up, and crossing, passed out eastward into darkness: the fourth, the road they were to take. 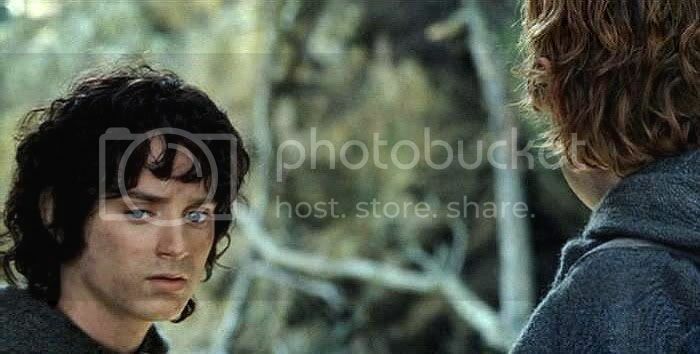 Standing there for a moment filled with dread Frodo became aware that a light was shining; he saw it glowing on Sam’s face beside him. Turning towards it, he saw, beyond an arch of boughs, the road to Osgiliath running almost as straight as a stretched ribbon down, down, into the West. There, far away, beyond sad Gondor now overwhelmed in shade, the Sun was sinking, finding at last the hem of the great slow-rolling pall of cloud, and falling in an ominous fire towards the yet unsullied Sea. The brief glow fell upon a huge sitting figure, still and solemn as the great stone kings of Argonath. The years had gnawed it, and violent hands had maimed it. 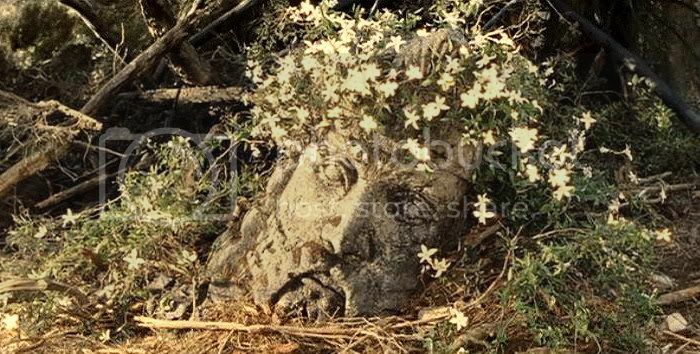 Its head was gone, and in its place was set in mockery a round rough-hewn stone, rudely painted by savage hands in the likeness of a grinning face with one large red eye in the midst of its forehead. Upon its knees and mighty chair, and all about the pedestal, were idle scrawls mixed with the foul symbols that the maggot-folk of Mordor used. ‘They cannot conquer for ever!’ said Frodo. And then suddenly the brief glimpse was gone. The Sun dipped and vanished, and as if at the shuttering of a lamp, black night fell. I want to say again how much I love Frodo in this book scene, and how well I think Tolkien wrote it. 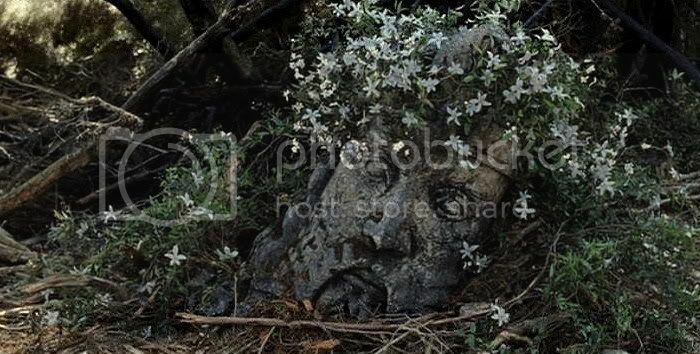 Every time I read the chapter it impresses, and moves me, how he makes the scene work, contrasting the image of the defaced body of the stone king with the image of the old king's head lying in the grass, crowned with flowers and illuminated by the Sun's last rays, the last natural light Frodo will see until he wakes up on Cormallen. Standing there for a moment filled with dread Frodo became aware that a light was shining; he saw it glowing on Sam’s face beside him. Turning towards it, he saw (...) the Sun was sinking (...) falling in an ominous fire towards the yet unsullied Sea. 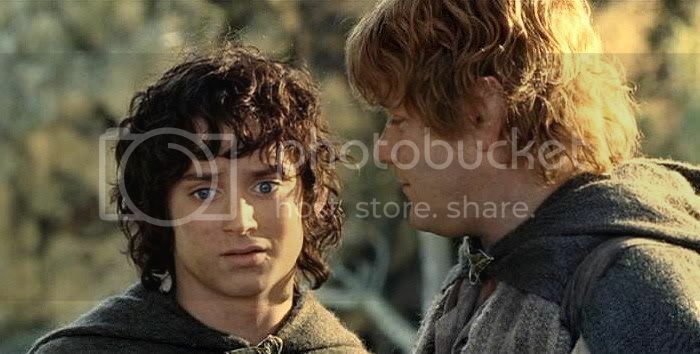 The description of Frodo seeing the last rays of the Sun reflected in Sam's face, to me, is particularly brilliant. 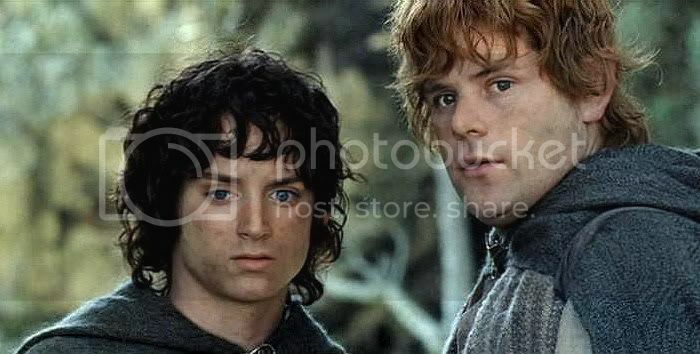 I think of it as a revelation of what will be Sam's role for Frodo as they enter the long dark of Mordor. 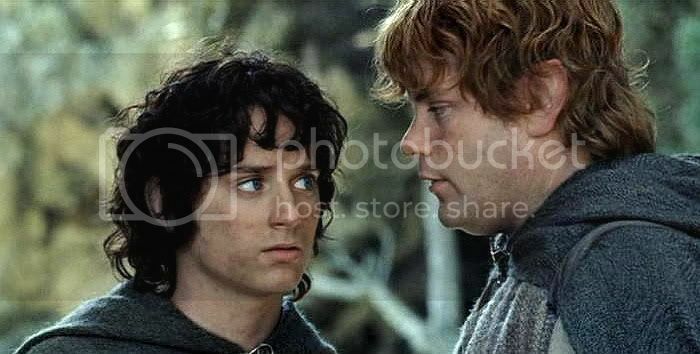 It's notable to me that Frodo doesn't first see the Sun itself, but only turns to look at it after he sees it reflected in Sam's face. In Mordor, where there is no light of Sun (or Moon or star), Sam will continue to reflect this last light of the West, not in a visible way but in himself. Frodo still has and will use the light of Eärdendil (the source of that light being the last Silmaril, in which is captured the primordial light of the Two Trees) contained in Galadriel's phial. But in the darkest of dark places, inside the Sammath Naur, even that light will fail. Then Sam will carry the last flicker of holy light into the darkness. Not visible light, but the light of hope that does not give up. 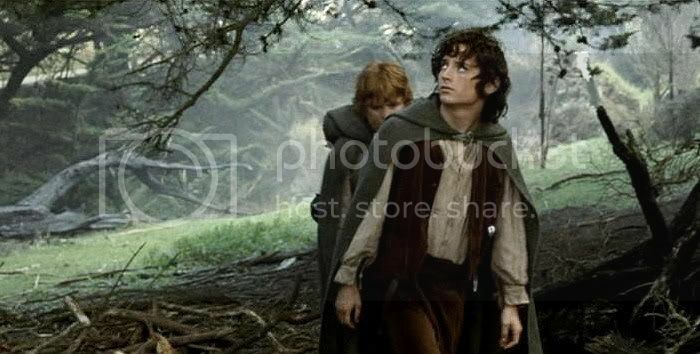 If Frodo is the story's "Ring-bearer", perhaps Sam is its "Light-bearer". The last part of the passage always strikes me with its almost biblical power. I am thinking of the way the Gospel of John portrays its thoughtful, very extended depiction of the Last Supper. Well into the discourse, Judas slips out to betray his master. "And," the writer says, "it was night". Just three one-syllable words, but how they resonate, dropped at the end of that long-sentenced discourse. I think Tolkien does a similar thing here. I don't mean Tolkien literally copied it, but he attended mass regularly, even daily; he would have heard this reading many times by the time he wrote this section of LotR. And then suddenly the brief glimpse was gone. The Sun dipped and vanished, and as if at the shuttering of a lamp, black night fell. "...black night fell." I can almost hear the satsfying "thunk" of it, as if a huge drop had boomed down at the end of an act, cutting the players off from the sound and light of the hall. For more fine writing, don't miss jan-u-wine's narrative poem, At the Cross-roads of the King. 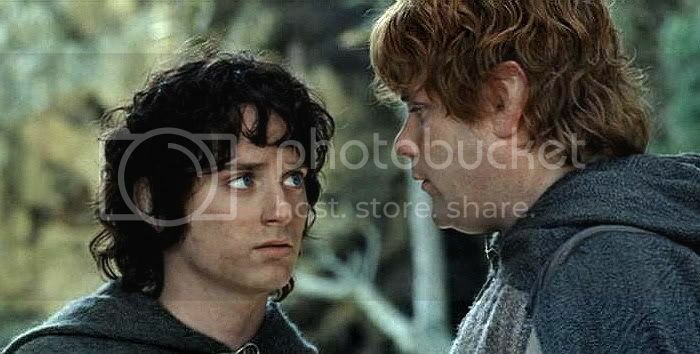 Written from Frodo's point of view, it powerfully imagines what might be going on for Frodo in this scene. It is posted after the screencaps. 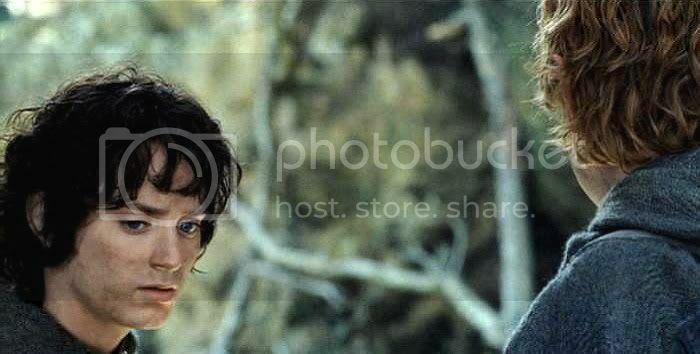 ~ Frodo and Sam reach the Crossroads, from the EE version of RotK. where nothing dwells save starless night. with stern beauty upon unbroken knees…. upon the proud curve of his neck. worrying the veil of the Sun). spilling in ribbons across the Road's harsh back. I look upon the face of the King. clouded with evil his Song. Silver-white star-flowers, coiled about with true-gold. speaking of days distant and sweet with peace. stretch between us like a promise. Note: last verse taken directly from ROTK (Journey to the Cross-roads). It is interesting to me to note that, instead of writing "forever", Tolkien wrote "for ever", which has quite a different nuance to it. ~ Ithilien Pt. 1: Ithilien Grows Dark ~ plus jan-u-wine’s “Too Often”. Ithilien Pt. 2: “The Days Are Growing Darker”. ~ Ithilien Pt. 5: The Cross-roads, plus jan-u-wine's "At the Cross-roads of the King". Is his droopy eyelid associated with fatigue, Chickenlegs? It always adds to the interest of his face, the disparity between the sides of his face, especially his eyes. Beautiful, both of your contributions. Thank you. You are welcome, Primula. And thank *you*. It is indeed! I love this scene so much and, as you say, every word seems to add to its poignancy. It's amazing, and it makes it a very intense moment. Isn't it a beautifully written scene? I also love the note that they moved along as "soft-footed as hunting cats". My only real gripe about the physical depiction of the film hobbits was their huge feet, which made them walk in a gallumphing manner. Illustrators have created a trend to think of them with big feet, but there's nothing in the text to imply they do. The Stoors were broader and had bigger feet and hands, but that doesn't their feet were gigantic, just larger than the Harfoots and Fallohides. I can't imagine them walking through the dry sticks and bracken Ithilien as silently as cats with those big, flapping clodhoppers. Like "hunting cats" implies feet that can step carefully and neatly. I do love that moment -- it always brings me to tears -- when the sun shines on the flowers and gives the hobbits hope for just a little bit. When I first read the book, this was one of the moments that really choked me up. The sunlight briefly touching the stone king's crown. "They cannot conquer for ever!" Oh Frodo and Sam, your quest will not be in vain. Turning towards it, he saw (...) the Sun was sinking (...) falling in an ominous fire towards the yet unsullied Sea. Wow. I know LOTR by heart, almost, but this particular line strikes me afresh as if I'd never read it before. I've forgotten which gospel writer it is that writes: "And it was night." I can check when I get home tonight. Although the gospel writers are primarily writing biography, they are also wonderful storytellers. Such a powerful moment. Good morning! Yes, "the yet unsullied Sea". I could say that over and over for the sheer pleasure of it. I mentioned the gospel reference above but didn't give the chapter and verse. It's John 13:30. And I was wrong above, really. I said that its impact came after the extended discourse, but actually Jesus dismisses Judas before the bulk of the scene, when he shares so much with the disciples. It's still a super bit of writing, though. I always thought John was the gospel writer most sensitive to what makes a biographical account literature. Those flowers were made to stand for so much, so well. Gee she's good with a turn of phrase. St. John somehow breathes a different air from the synoptic gospel writers (of whom my favourite is Luke). The human nature of Jesus is very vividly portrayed in the gospels of Mark and Luke ... of course they show His divinity too but He is at His most mysterious and enigmatic in John's gospel. Agree on Jan's phrasing, and agree that Jesus is mysterious and enigmatic in John's gospel. It's my favourite gospel, though, as much for key stories (key to me) that are in it as for the way it reads. A great read, Mechling, with gorgeous caps accompanied by a moving poem by Jan. Thank you ladies! …Like "hunting cats" implies feet that can step carefully and neatly. There is little or no magic about them, except the ordinary everyday sort which helps them to disappear quietly and quickly when large stupid folk like you and me come blundering along, making noise like elephants which they can hear a mile off. Oooh! Perfect quote, Estë. Thank you!